A full-grown Royal Bengal tiger has been unleashing terror in and around the Bara Bazaar area under the Rowta Police Station of Assam’s Udalguri district forcing locals to spend sleepless nights. The area is in the vicinity of the Orang National Park and is often frequented by tigers resulting in loss of human life and livestock. Notably, the Orang Tiger Reserve has grabbed national headlines for having one of the highest density of tiger populace within its smallest core area of 78.28 sq km, housing as many as 28 big cats. This was revealed in a census done between January and March 2017 during phase IV of the all-India tiger estimation programme of the National Tiger Conservation Authority (NTCA). A wildlife conservationist of the area told NE NOW that the tiger has hunted livestock like cattle, pigs and goats since November 11. It has been spotted at Bara Bazaar area by locals. Despite repeated attempts, the Forest Department has failed to trap the tiger and shift it to the Manas National Park. “Till date, five cows, six pigs and two goats were killed by the tiger. 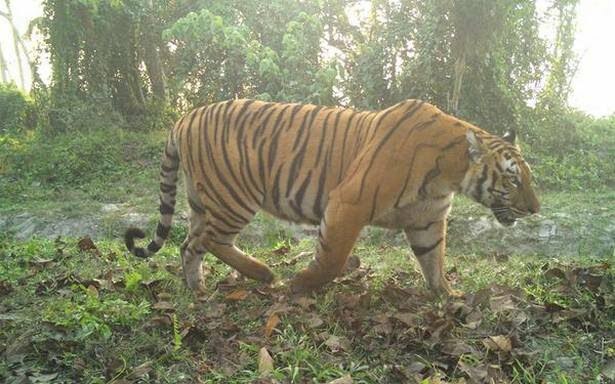 We hope that the tiger will be trapped in a day or two and it will be shifted to Manas National Park,” said a forest official. The Forest official also pointed out that the increase in the population of Royal Bengal tigers in the Orang National Park is the possible reason for their straying into human habitations due to lack of adequate forest cover and abundant food. Meanwhile, the Forest Department of Udalguri district has put into place safety measures for panic-stricken villagers and a number of cages have been placed in the vicinity of the area frequented by the big cats.